This time it’s Brian Adams, who was known as Crush when he was part of the tag team Demolition. This is happening way too frequently. The powers that be in pro wrestling have a reputation of chewing guys up and spitting them out–not really caring about what happens to them afterwards, but sooner or later this is going to come back to haunt them. This is just bad marketing. It’s sad that they will only be able to see the business side of what all of these deaths mean, but if those are the terms that get them motivated to try and change things, so be it. PacMan Jones is a Wrassler! The Tennessean dropped that bomb today. I hate to say it, but this worries me. Professional wrestlers have a hard enough time staying out of trouble and living clean lives without throwing in bad seeds like PacMan Jones. Why stop there? If TNA is going to stoop this low they might as well send Barry Bonds down to ringside to be his manager carrying a Louisville Slugger. They’ve lost all legitimacy. All the talk about Barry Bonds has apparently quieted all talk about Chris Benoit. I guess the media only has so many minutes of each day it is willing to devote to steroid junkies? 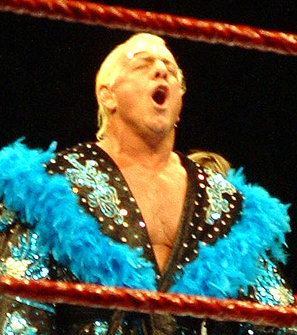 The real question…will anyone ever be World Champion 16 times like Ric Flair? And is so, can they do so without the use of steroids? In my estimation, no way.